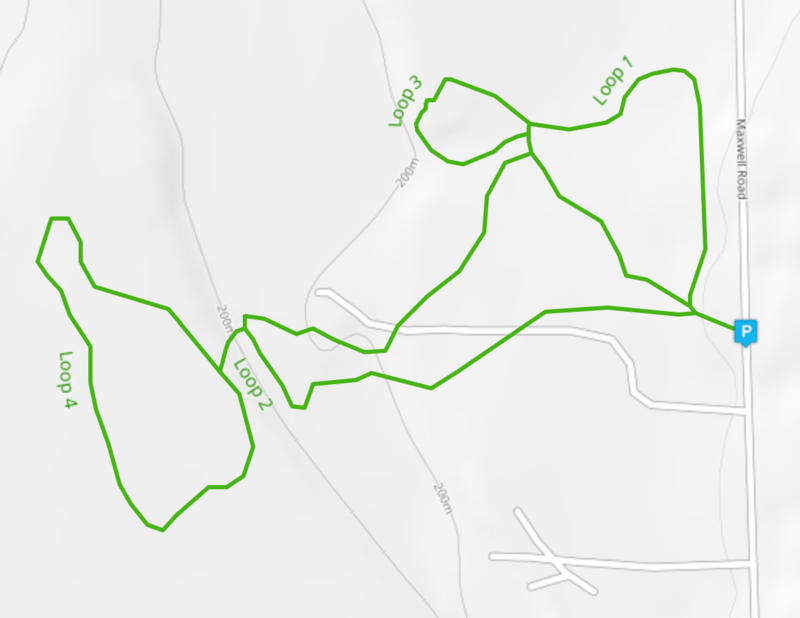 This is a decent trail if you're in the area and is definitely worth stopping for. 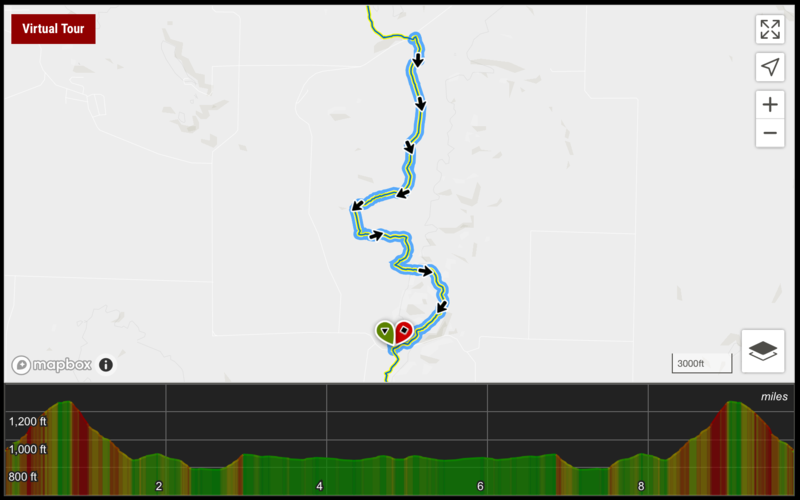 The trail has some nice flowing sections, mild climbs, and some rooty technical sections. It proves fun for experienced riders and a slight challenge for beginners. The trail does cross paved paths a few times if you need to bail, as well. 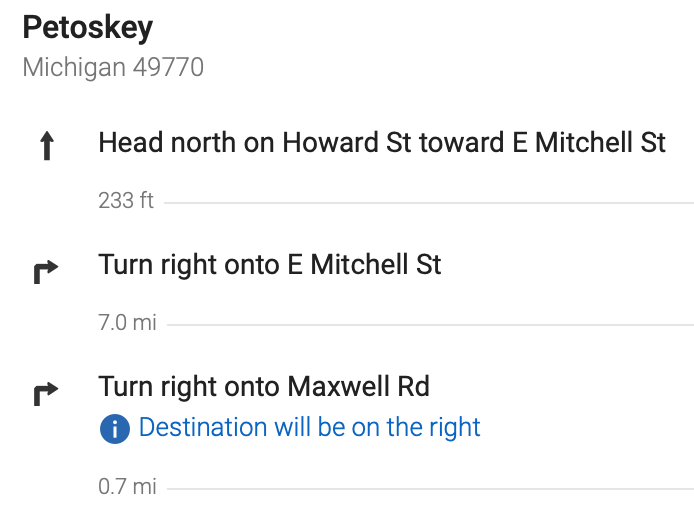 GPS had me at less than 5 miles, but it's supposed to be 6-7 miles. Can be done twice for a longer ride. From beautiful hill top vistas to dark, cool cedar swamps and pine plantations, the High Country Pathway (HCP) provides the full Michigan woods experience. Home to the largest free range elk herd this side of the Mississippi, the HCP crosses through three counties with very little sign of civilization. This 80-mile loop is perfect for an all day, or two-day adventure for those that enjoy rugged, unimproved trails. You'll have the opportunity to see elk, deer, bear, beaver and more along the way. 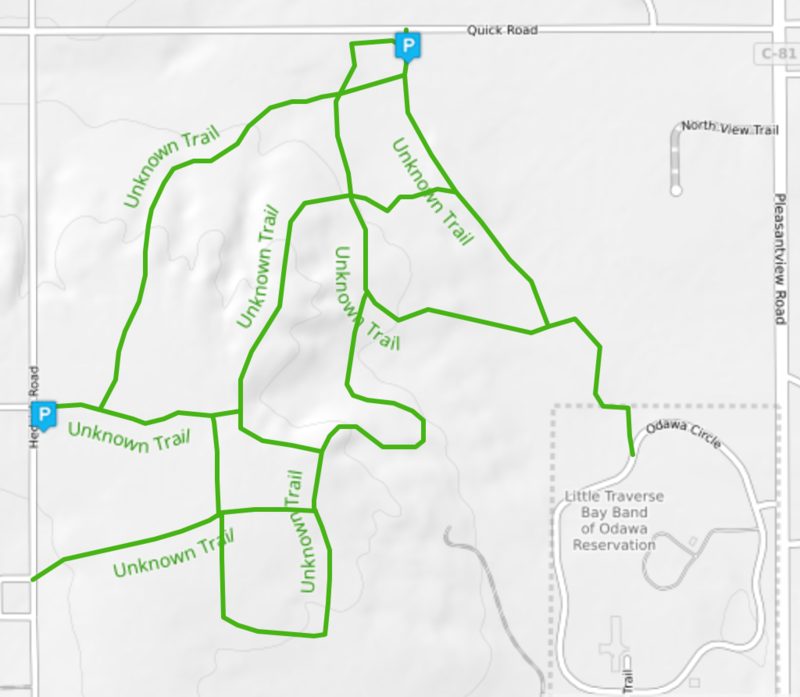 This ride utilizes a mix of two track and singletrack multi-use trail at the Little Traverse Conservancy's McCune Nature Preserve. Minnehaha Creek passes through the property, making for a lush and scenic setting. 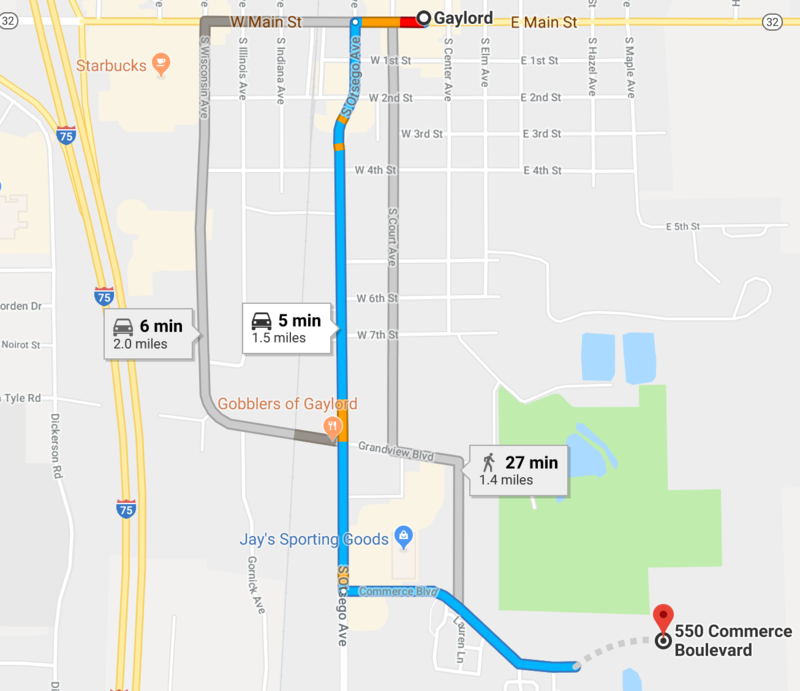 It is best to start from the Berger Rd parking lot, although there is also parking located on the east side off of Maxwell Road. The trail is groomed for winter use as well. The mostly non-technical trails and minimal climbing make this area great for new mountain bikers as well as for winter fat biking. Another great rustic section of the North Country Trail. This trail has been a hiking trail for many years. Mountain biking is allowed on this trail and the local IMBA Chapter, TOMMBA, helps maintain various sections in this region. It is mostly singletrack and a variety of beginner sections mixed in with some steep climbs and small technical sections on those climbs. Mostly a friendly singletrack with mix of intermediate challenges. A fun, rustic biking trail with lots of great winding singletrack in densely wooded terrain. This is mostly singletrack but there are sections of two-track and is part of a multi-state hiking trail. This section allows mountain bicycling and it's a terrific section. 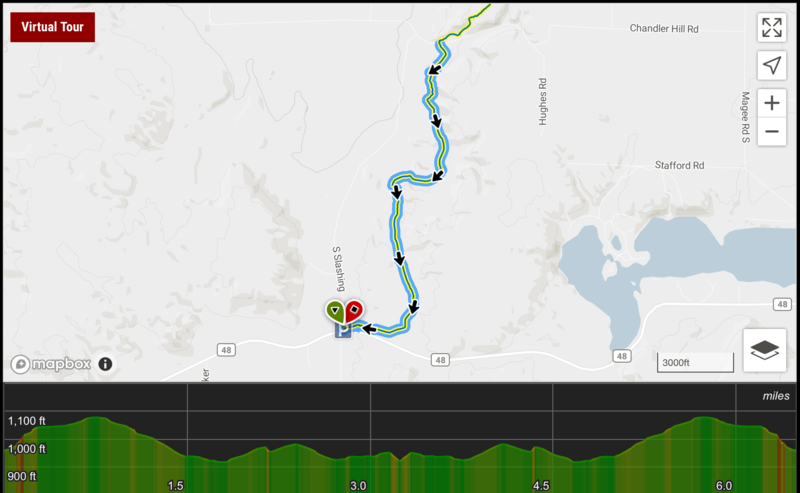 It features great terrain, a couple of small bridges, and some steep climbs. This trail is one of many sections of the North Country Trail which can be ridden for a wide variety of distances. 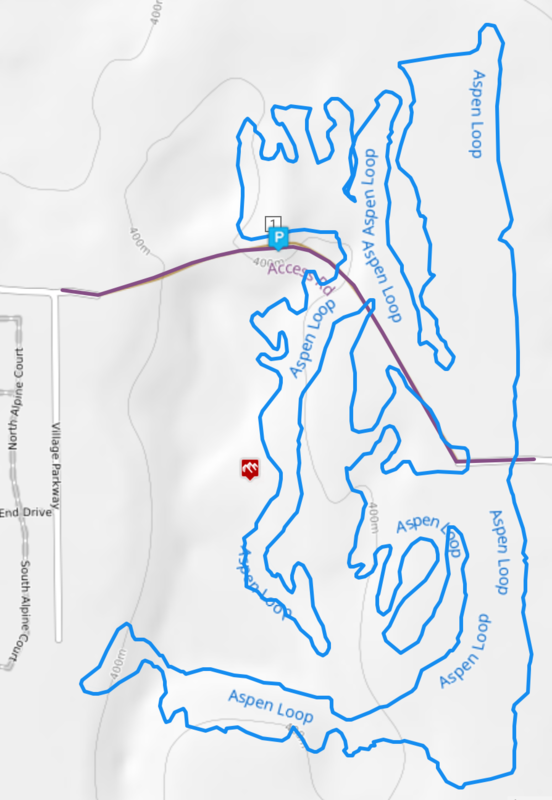 This trail is primarily a hiking trail but is a favorite of local mountain bikers. Mostly this is a beginner/intermediate trail and has sections that are tougher than others, but most mountain bikers will find the wooded, hilly terrain exciting and challenging, yet friendly. A great rustic section of the North Country Trail. This trail has been a hiking trail for many years. Mountain biking is allowed on this trail and the local IMBA Chapter, TOMMBA, helps maintain various sections in this region. Due to the Emerald Ash Borer, many trees fall on this trail. 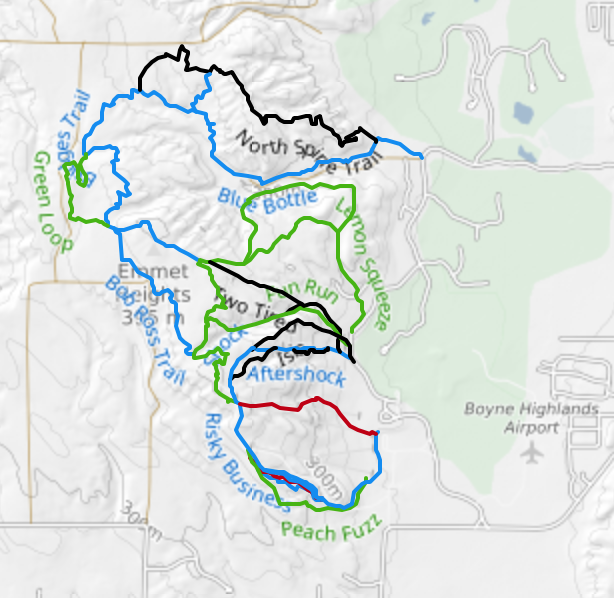 The summer of 2015, the trail would have been cleared of all downed trees and three more would have fallen on the trail in the following week. Volunteer maintenance teams tackle these as they can but it has been a real problem. Although there are few blind turns, keep an eye out. This trail is mostly singletrack. However, there are short sections of two-track. To ensure you stay on the trail, make sure to always look for the blue rectangles painted on the trees. Be especially watchful when on two-track as there is sometimes an unexpected turn off the two-track back onto the singletrack. Turns are indicated by two blue rectangles, one on top of another. The top rectangle is placed to one side or the other, indicating the direction the trail turns. From the Kipp road trailhead, the trail turns upward almost immediately, for about a mile-long grinding climb. From there, the trail will be a bit of a roller coaster ride, with several steep climbs. 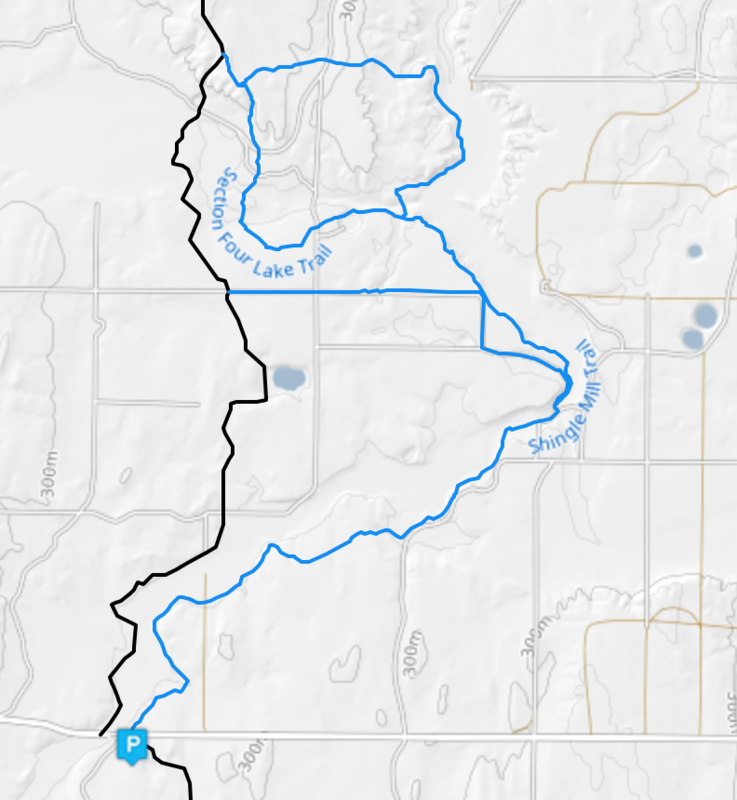 At Stutsmanville road, you'll have to ride a mile of pavement to get to the next trail segment. This section will be mostly flat and quite wet. Narrow boardwalks are installed in some areas. Section 4 mellows out some as you travel through sandy old pine plantations; grades are shallower and the trail is wide open here. The trail starts out at Levering road, completely flat. You'll be kept from really cranking up your speed by constant whoops and bumps, the legacy of Michigan's lumber age. As you come around the north shore of Wycamp lake, the dunes start to increase in age. 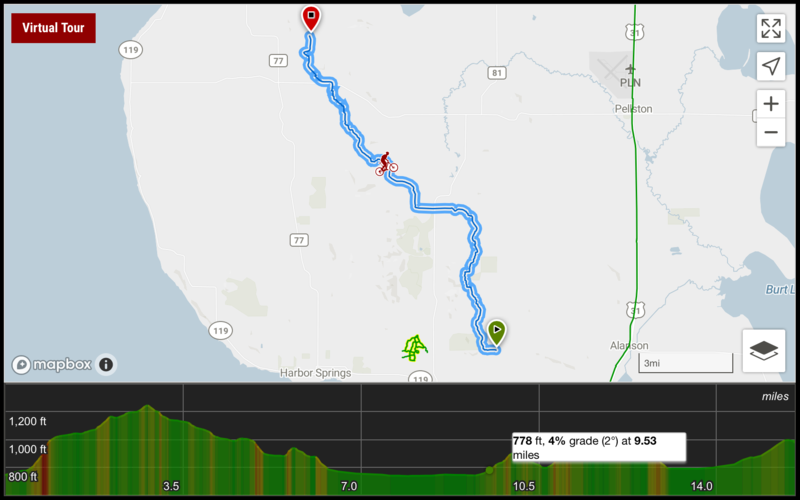 For a couple miles, you'll have the pleasure of short, low-grade climbs followed immediately by similar descents. After you cross Sturgeon Bay Trail, the forested dunes are even more ancient, and accordingly larger. A large number of climbs here will be to steep and sandy to ride, so you'll have to get off and push for your scenic views. The trails at Offield Family Nature Preserve make up a multi-use, non-motorized trail system in one of Little Traverse Conservancy's many great preserves. This is a fun ride on its own or it can be combined with nearby Boyne Highland's trails for a longer ride. Winter grooming makes for fun snow biking, too. Parking is located at the northern end of the preserve off of Quick Rd. or on the western side off of Hedrick Road. 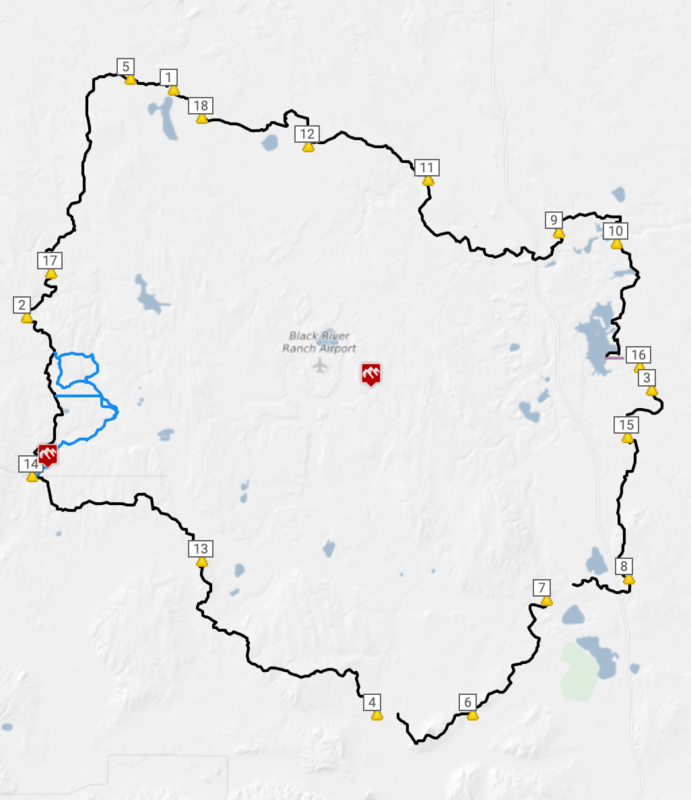 There are a variety of loops and connecting trails that you can ride to add some variety to your day or to adjust the length of the ride. Three loop options include river views, towering mature hardwood forests and pine plantations. The 10-mile loop is very popular with a stop at Section 4 lake and it's deep blue water and storybook scenery you'll notice in the pictures. All loops end up riding back to the trailhead on a quarter mile long boardwalk in dark cool cedar forest that runs along the Pigeon River. If you like a more remote trail experience, where you have an opportunity to see a completely undeveloped forest that's home to elk, bear, bobcat and more, the Shingle Mill has exactly what you are looking for. The Shingle Mill Pathway offers a beautiful glimpse of the Pigeon River State Forest sharing some of the best terrain of it's larger brother, the High Country Pathway. 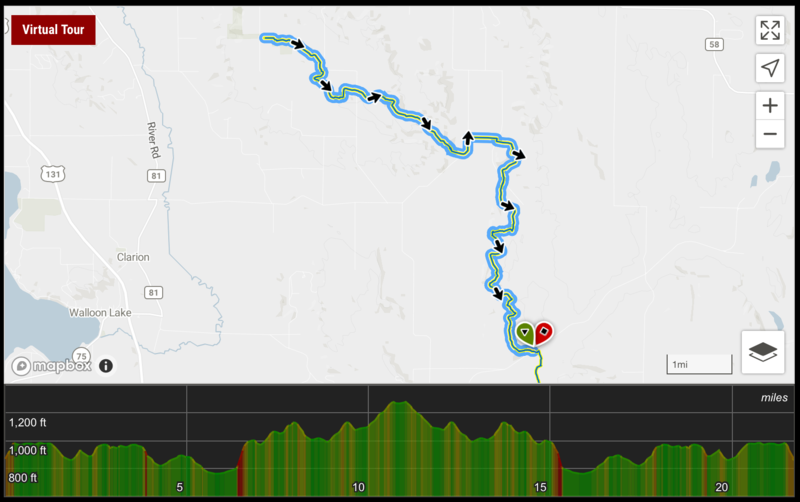 You can either ride the complete 11-mile loop, or shorten it by using the Shingle Mill 6-Mile Cutoff, or the Shingle Mill 10-Mile Cutoff. 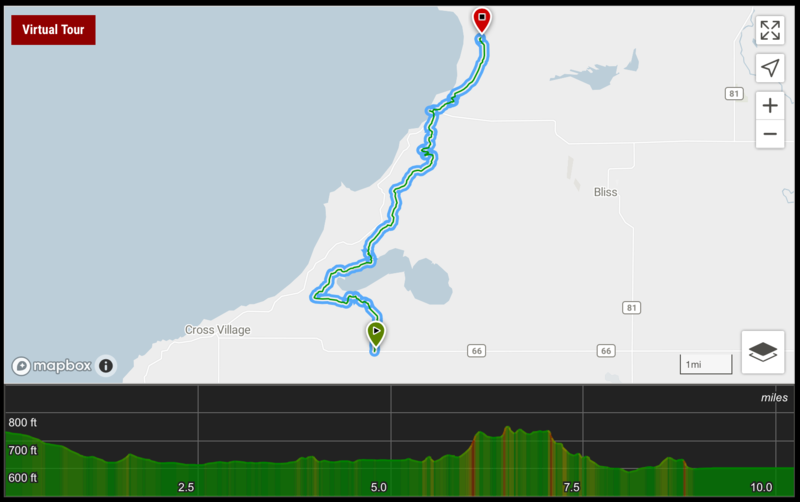 The trailhead is located on Sturgeon Valley Road across from the Pigeon Bridge campground outside of Vanderbilt, MI by roughly 10 miles. Parking is across from the campground and the trail start is located within the campground itself. 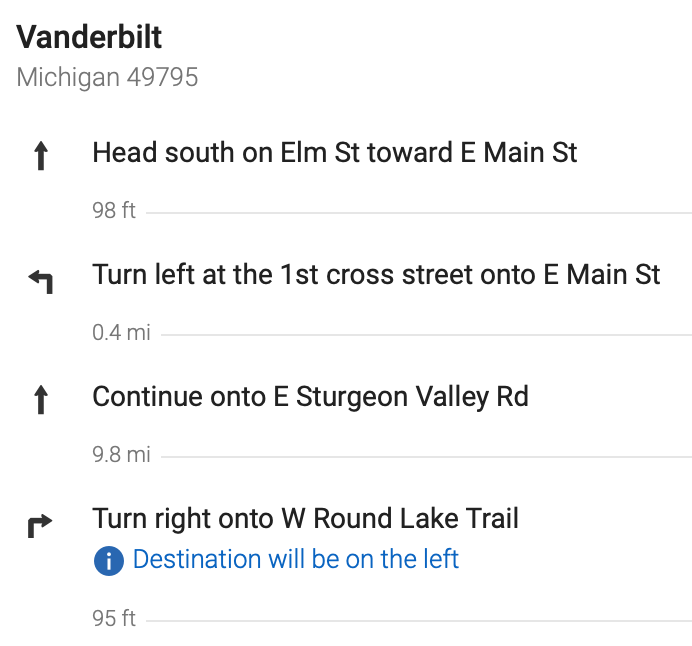 An alternate trailhead is at 9966 Twin Lakes Rd, Vanderbilt, MI. Parking is available next to the forest headquarters building.